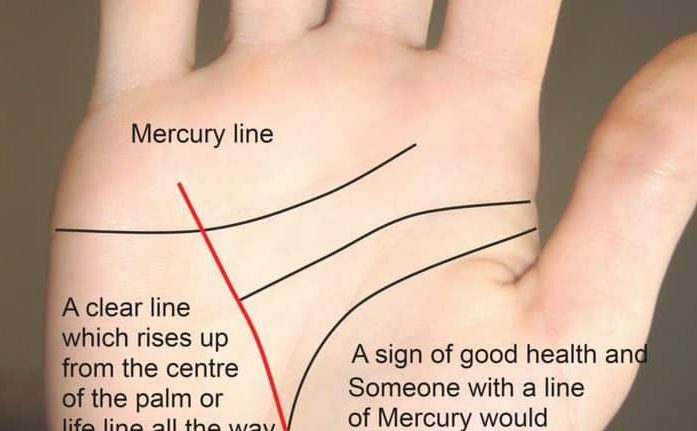 The Mercury line also called a health line or line of the liver describes a person’s overall state of health. It usually starts on the Mount of Moon and runs upward towards the Mount of Mercury. This line mainly in indicates the state of the liver and digestive system. However, because of the qualities of Mercury, it can also depict business success or failure. If the line runs deep onto the Mount of Mercury with rising branches, it shows great success in business. When this line is not present on the hand, it is that the individual is quite robust and rarely suffers health issues. The best kind of line is a clear, strong line because it implies someone with a good constitution. If at any time the line appears red, inflamed or otherwise discoloured, it can mean there are toxins or an infection present and the body is trying to fight it. A weak line is faint, fragmented, chained or multiplied. It can show the health is not as robust as it could be, but I have seen a weak line of mercury on perfectly healthy individuals who say they rarely suffer any illness. When this is the case, I believe the person may be very aware of their body and take care not to do anything which may upset their system, such as eating the wrong types of food—for if they did, they might discover some health issues such as digestive complaints. If the line is chained throughout, it is said to be a condition of a diseased liver and or stomach. With every appearance, variation or defect in the line, as always, the head and life line should be consulted first. Also look at the nail colour and fingernail marks, for potential clues. Please remember that just one feature alone in palmistry is not an actual diagnosis of any disease. Read about all the features of the mercury line, out soon: Destiny Palmistry All The Lines. Next PostNext Long Narrow Hand What Does it Mean in Palmistry?